Outlander focuses on Roger’s treatment at the hands of the Mohawk tribe as Brianna confronts Stephen Bonnet. I mentioned last week that this show has failed to correct the stated observation that fiction never tells stories from the perspective of the Native Americans and this episode does nothing to fix that issue. The narrative unfolds entirely from Roger’s perspective which means that the Mohawk tribe are characterised are brutal taskmasters who don’t treat him with any measure of humanity. No attempt is made to explore their culture, values or beliefs in any detail which makes this another shallow portrayal of Native Americans in order to enable Roger’s development. There is some attempt to establish nuance through Johiehon (Sera-Lys McArthur) who takes pity on Roger and gives him a herb that will help manage the pain he’s experiencing but it’s nowhere near enough to correct the shallow portrayal and ends up serving as background detail for another character. This portrayal is clearly very deliberate as evidenced by how Roger’s story progresses. 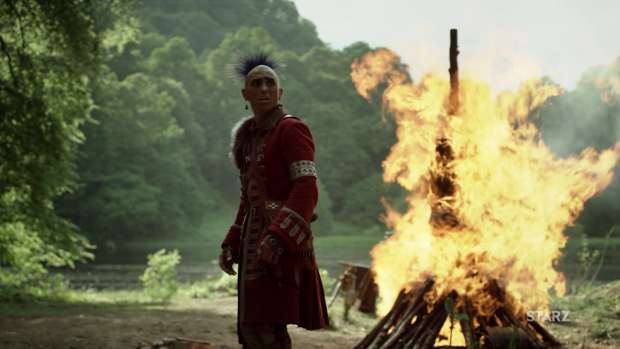 It’s a shame that the writers are so flippant with their portrayal of the Mohawk because Roger’s story is actually very good. The time he shares with fellow prisoner Father Alexandre Ferigault (Yan Tual) allows for exploration of the impact of recent events. There hasn’t been a lot of focus on Roger’s emotional state since he was beaten and sold to the Mohawk tribe so it’s certainly welcomed. Father Ferigault is a prisoner of the Mohawk tribe because he fathered a child with Johiehon and refuses to baptise it because he considers what he did to be a betrayal of the oath he took as a man of the cloth. To baptise the child would mean a tainted blessing so he refuses to do it because he feels that he has shamed himself. Roger doesn’t see Father Ferigault’s point of view because he’s far from a religious man so sees slavish devotion to religious dogma to be idiotic. He points out that he doesn’t even have to perform a real blessing because the Mohawk won’t know the difference but Father Ferigault refuses to do even that because he sees that as being deceitful and misrepresenting what the blessing stands for. Roger and Father Ferigault are similar in the sense that they are both being punished for falling in love. The key difference is that Roger is largely a victim of misunderstandings and circumstance where Father Ferigault is a victim of his own sense of pride. 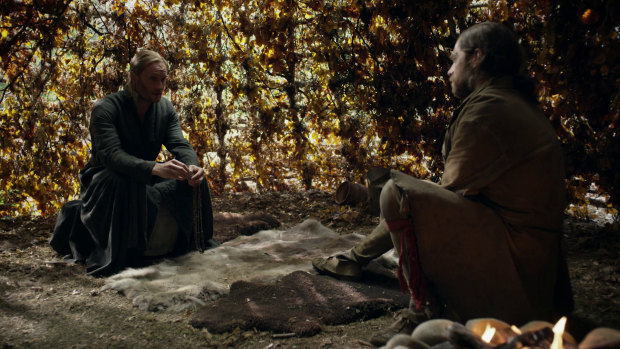 It is established that Father Ferigault was once looked on favourably by the tribe and that his relationship with Johiehon was accepted by them until he refused to bless the child. His own values put them at odds with those who had accepted him. This is where putting work into fleshing out the culture of the Mohawk tribe is necessary because there’s absolutely no context for why the lack of a Christian blessing for the child means so much to them. As interesting it is to see how Father Ferigault’s stubbornness dooms him there isn’t enough time to fully develop this character. Effective writing shows the reader/viewer something rather than telling them about it so this episode fails in that regard as Father Ferigault’s relationship with Johiehon is delivered entirely through exposition. They don’t share any scenes together so there’s no grounding for this intense relationship that they are supposed to have which makes it difficult to fully sympathise with Father Ferigault. I recognise there is only so much time in a given episode but investing in Father Ferigault is made more difficult because the thing that defines him isn’t tangible wthin the story. Using Father Ferigault’s situation as an opportunity for Roger to reflect on his experience is something that works really well precisely because the context of what he has been through exits. He talks about Brianna’s rejection of his marriage and his pursuit of her ending up in them being Handfasted. Roger’s experiences since that point have caused him to regret his decisions because they led to so much strife and resolves to only look out for himself as his mindset at this point is that nothing is worth what he’s been through so it makes more sense for him to be selfish. This is an intense emotional reaction to what he’s been through but the end of the episode proves that Roger isn’t the sort of man who can turn his back on his sense of responsibility. He spends a lot of time focusing on digging the hole that would allow him to escape and is all set to secure his freedom but he can’t ignore the screams of Father Ferigault as his is slowly burned to death because of his refusal to baptise the child. Richard Rankin’s performance in this scene is excellent; he brilliantly conveys the internal conflict experienced by Roger as he fights his better nature and tries to be selfish so that he can escape. He isn’t able to turn his back on the suffering of another man and heads back to the village in order to give Father Ferigault a quicker and far less painful death. There was no way for Roger to save him on his own as the odds are entirely stacked against him so the action he does take would qualify as an act of mercy. Everything about the death of Father Ferigualt was set up to be an impactful moment and the execution of it certainly makes that work though the emotional resonance isn’t as strong as it should because of what I’ve said about the lack of investment in this overall situation, Johiehon joining him in burning to death lacks the necessary impact beyond the shocking visual which is definitely as a shame because if the groundwork had been done then this could have been both powerful and devastating. The capture of Stephen Bonnet means that Brianna is able to confront him to get some sort of closure on what he did to her. John facilitates this because he understand that she needs to do this for her own sanity. The conversation between them works really well allowing Sophie Skelton another opportunity to show off her excellent acting ability. She plays Brianna as being clearly afraid but also determined to face the man who raped her and show him that she has been able to live her life despite what he did to her. The complexity to Brianna’s reaction to the situation helps make this feel all the more real. Brianna also takes comfort in the fact that he will face punishment for all of the crimes he committed and lose his life in the process. She points out that he will be forgotten as he rots in the ground and the only thing left of him will never know that he existed. It’s not clear if Bonnet’s legacy is in any way important to him but knowing that history will simply forget you can’t be an easy thing to hear. Bonnet presents the appearance of a man who has been defeated and is waiting for what’s coming to be over with. He even presents something resembling well-being to Brianna when he urges her to take care of the child and presents her with a valuable stone in order to help with that. It doesn’t qualify as regret but acceptance of responsibility might be a fairer way to describe his reaction. Brianna likely wasn’t expecting him to be anything other than the unfeeling monster that violated her all those months ago so is noticeably surprised when he displays complexity. Unfortunately for Brianna this doesn’t mark the end of Bonnet’s ability to terrorise her life as he manages to escape thanks to Fergus and Marsali’s plan to spring Murtagh from the jail. The keys to his chains are dropped within reach in the confusion and he manages to get to them before the jail explodes. 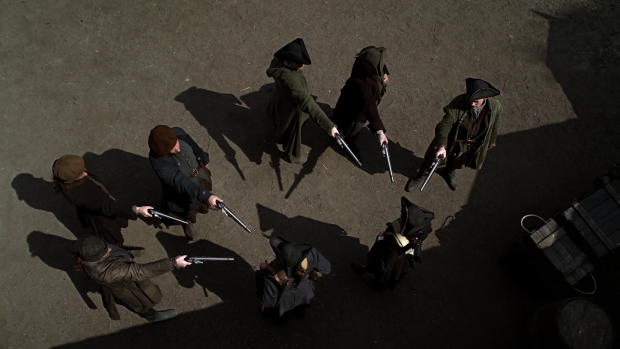 This is an unintended consequence of the jail break and retains Bonnet as an antagonist for a while longer though having Murtagh free again is certainly an advantage for the show in general and Bonnet being around will in theory make things more interesting. Prior to the jail break there’s a great scene between Marsali and Fergus where she supports his plan to free Murtagh whole heartedly because she takes on board what is important to Fergus and reminds him of her vow to be there for him whenever needed. It’s a really touching moment in a relationship that doesn’t often take the spotlight. It’s good to focus on it because it’s very different from the Claire and Jamie relationship and shows that they aren’t the only couple to be more or less perfectly in sync. An uneven episode that definitely has merit but still has issues representing the Native Americans and doesn’t do enough to make the audience invest in everything they need to. The biggest problem is the portrayal of the Mohawk tribe as there is absolutely no context to their beliefs or values so they come across as shallow antagonists. Father Ferigault is in theory an interesting character because of the explained complexities around fathering a child against the code of the Church and what he has to do to stay alive. Roger points out that he doesn’t actually have to go through with it as they won’t know the difference but he would rather resist in order to uphold his ideals even though that leads to his death. This allows Roger to reflect on everything that has happened to him and resolve to be more selfish from now on though his better nature gets in the way of that at the end of the episode. The trouble with the Father Ferigault plot is that it relies on exposition to establish the relationship he had and what led to his downfall but there’s no reason to invest in this as it isn’t explored properly. This robs the ending of much of its power as the ground work hasn’t been established properly. Brianna facing Stephen Bonnet is really well handled thanks to an excellent performance from Sophie Skelton. She plays it with a wide range of emotions that helps the situation feel all the more real. Bonnet also exhibits a small amount of humanity when he shows acceptance of his responsibility and urges Brianna to take care of the only thing left of him. It’s a compelling interaction and there will clearly be further complications now that he has managed to escape once again. The episode also delivers a really charming moment between Marsali and Fergus when she supports him whole heartedly on his mission to free Murtagh from prison because she sees that as part of the vow she took to support him. It’s a different relationship to that of Claire and Jamie which shows that profound connections come in all shapes and sizes.